In March 2007, Lele set up a stand outside his store in Moca so that a group of friends could share in cooking and eating the delicious root they dug up in the hills the previous day. ñame (NyAH-meh), a variety of yam, grows to various sizes and has pale yellow or white flesh or pith. There are several varieties of yam some, like ñame blanco, Dioscorea rotundata is originally from West Africa; others come from tropical Asia, Brazil and other areas of South America. Dioscorea and its varieties is a plant that’s been cultivated for over 5,000 years around the world. Here Lele made a sancocho, adding oxtail for the broth the ñame cooks in. I also got to go ñame hunting with my cousin Papo in the hills of a farm that his friend owned. One searched through brush for the right leaves, and with knives began to carve out the soil to yield the root. Large and heavy with moisture, the roots can easily weigh several pounds. Grated, people make bunuelos de ñame, or have them along with other roots, as in verduras con bacalao, which can include a selection of yuca, batata, malanga, yautia and guineos verdes (green bananas), simply boiled with bacalao (cod fish) on the side, drizzled with olive oil. Mash it, bake it, boil it or sauteed, roots can provide a filling, tasty meal. Here’s a photo taken in the 1950s of a man coming out of a jungle carrying a large wild yam on his shoulder from the Library of Congress website. (This yam was not eaten but used as a source for hormones.) Still, it gives an idea of the size these roots can often grow to- and they can reach 130 pounds. Ideas around race are linked to food and that’s reflected in the local name in the image, however where the photo was taken is not mentioned. Many in Moca know how to differentiate the leaves of different varieties and where they grow. As a child in the Bronx, I learned the varieties from the refrigerated bins in bodegas, with my mother teaching me which root was which from the different shapes and skins. Not far from the start of Calle Barbosa, off the main Plaza in Moca, are a series of two story buildings with small stores on the first floor. The older wooden buildings that used to occupy these blocks have disappeared, in part to take advantage of concrete in the event of hurricanes or fire. The latter happened in 1911, just a year after the 1910 census was enumerated for Moca, when a fire swept through most of the block, destroying structures and displacing some residents to other addresses and locations. Despite the use of concrete during the 20th century, many buildings retain details from older architecture, such as tall, narrow wooden doors and frames. A store at street level often has a set of two doors, to enable the passage of both air and prospective customers through the space. Above the doors in neon are the words “Milo’s Candy Store” that becomes illuminated script at night. Milo Gerena’s candy store is a riot of colors, with tiny handmade signs done in black, blue and red ink. He also sells little bags with prizes, candy and a small white card decorated in ink that announced what bounty awaited the winner when trading it in. The counter is from the forties or fifties, a narrow affair that wrapped around the space where Milo works serving coffee, sandwiches or other easily prepared food to the customers seated on one of the six red vinyl stools. On the end nearer the door, are the displays of hard and soft candy, along with small boxes that displayed dulces del pais, local sweets wrapped in plastic made of coconut, peanut, sesame or walnuts cut into squares or flat round shapes. Milo grew a long white beard as a promesa for his mother, Librada Gerena [QEPD] a skilled tejedora who made mundillo together with his sister. 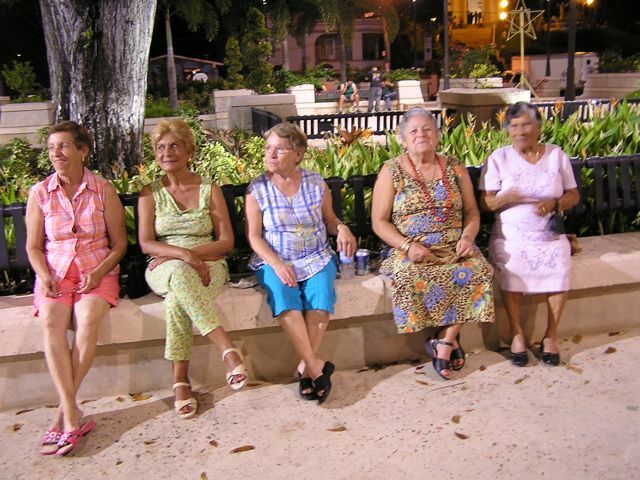 When I stayed in Moca for a few months on my research trip on mundillo, I had the pleasure of being adopted by a group of women at the Plaza and the spot was jokingly called, La Punta de Viejas. We moved around the edges of the plaza, so there really wasn’t one spot, but whereever the gathering was, there was La Punta. It was fun, and over time the mix of women changed for one reason or another. In different sections of the plaza, people grouped by age, family, friendship to talk, crochet, make lace, sing, or play dominoes until 11 or 12. One could relax before sleeping and facing the next day. No need for a watch, as the bells played from the church of Nuestra Senora de la Monserrate, which sits on a hillock on one side of the plaza. Going around to the right is the Alcadia, a combined City Hall and Mayor’s office, Jaime Babilonia’s Pharmacia, different shops, and the police station sits opposite the alcaldia. Most buildings are of concrete and reinforced bars, but years earlier, they were of wood. Traditionally, the Plaza was a site that served as the crossroads of a town. Located at the heart of town, adjacent to both the Iglesia Monserrate and the Alcaldia, the church and the state, people met to talk, share a quick snack, or just take the breeze. Older folks spoke of the tradition of walking the perimeter of the Plaza, so that youth could check each other out in a controlled manner. One could catch the trade winds, enjoy the company of others, or attend concerts or other events. The first plaza in Moca was a cleanly swept area at the base of this hill at the front of the Iglesia de Nuestra Senora de la Monserrate, the Catholic church built in 1854. At harvest time, the area was used to dry coffee beans in the sun. 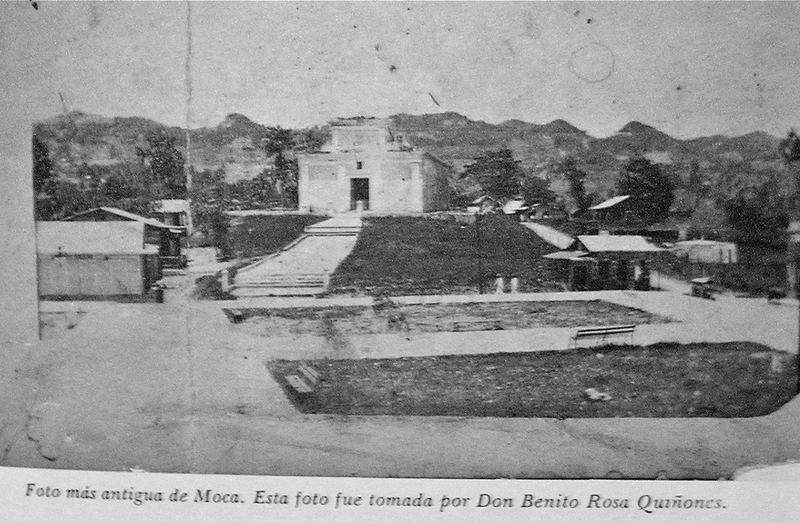 This is the oldest photograph of Moca, taken in 1914 by Benito Rosa Quinones. It shows the church, and at the base of the hill is a small wooden building. This was a small bar, and in the strong tropical sun, two men walk away dressed in loose white suits and straw hats that glare in the sun. Over subsequent decades, the plaza underwent a series of makeovers to accommodate the growing population. The views in the next image are from opposite sides of the Plaza– the 1927 image is taken from the steps of the church, looking down. The large wooden buildings that lined the streets around were a mix of homes and businesses, a block of which burned down a year after the 1910 census was recorded. By 1920s, the Plaza was rebuilt as a park, where people could meet for business or pleasure. The courtship ritual of walking the plaza involved an inner and outer ring, the first consisting of young women and their chaperones who walked or sat, while young men walked the perimeter, and initiated contact. 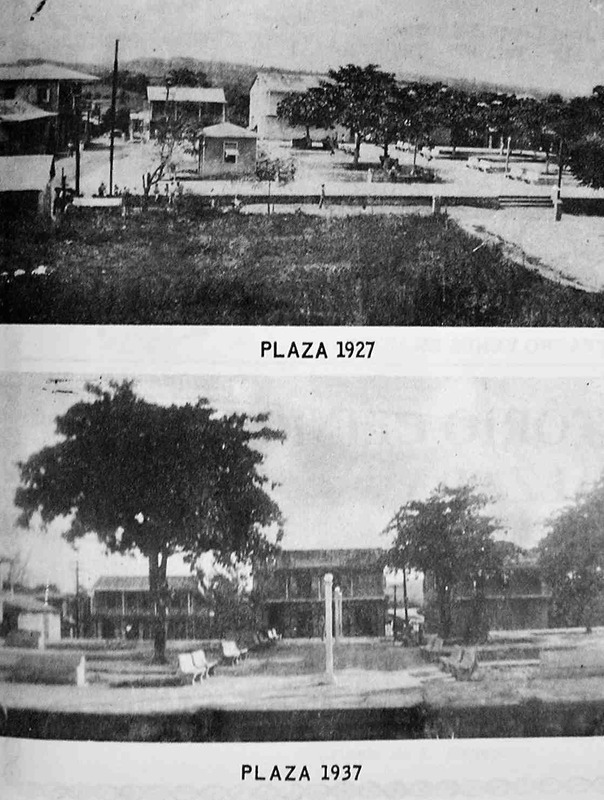 La Plaza de Moca, 1927 & 1937. From Libro de Fiestas Patronales, Moca (1980). Almond trees were planted and benches installed, a layout modified in the 1930s. By the 1950s, the trees gave way, and in the 1970s, concrete domes were installed for concerts and public celebrations. By the 1990s these were demolished, and later, the electrical cables that lined the sky were put underground. The latest plaza has small fountains and is filled with tropical plants. Gone are the benches, instead the heavy marble fence that winds around each of the sections serve as seating while subdividing the space that sits before the church. In one corner sits a sculpture of a tejedora, a lacemaker, to commemorate the women who were incorporated into the rise of the garment industry in the early twentieth century, and continues a tradition around mundillo that still gives folks a reason to visit Moca. In 2006 I had the honor of visiting Don Pedro Mendez Valentin, one of the founders of Los Enchaquetaos in Moca. Don Pedro built a small building in back of his home, which after my first two visits, he took me on a tour of. It was a small plywood building with a pitched roof, whose stairs led to an interior lined with shelves. On them were objects that he collected for many years– bottles of products bottled in Moca, that included various sodas, liquors and even seltzer water. Besides bottles, there were paperweights, a barber’s kit, things that he understood had no value for those discarding them, but that had historic value as the material culture of Moca’s past. Times were changing, and he was fascinated by what was left in its wake. 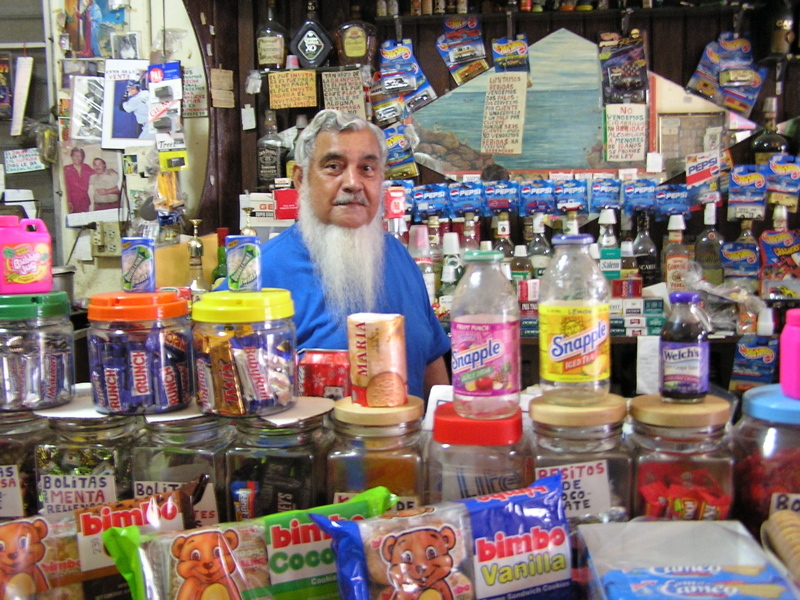 Moca actually had its own soda and seltzer plants, small businesses that older people remembered, but it was Don Pedro who saved the bottle. Labels identified what area of Puerto Rico the bottles were from. It was not only bottles, but other things that spoke of the past– a carved wooden handle that ended in a long sharp point was actually used to test the curing of bales of tobacco. One poked it in and could tell by the smell of the residue whether a bale was ready or not. Underneath are some of the cast iron weights used in a scale. The soda bottle is from La Puertorriquena, a plant established in Moca that lasted from 1925-1932. It seems the owner was one FC Benejam, whose name appears on top of the logo. The bottle originally had a plug with a metal wire that sealed it. According to Angel M. San Antonio’s Hojas Historica de Moca (2004, p.127), the company made cola, lemonade, raspberry, vanilla and cream of anise flavored sodas. Among the employees were Esteban Lorenzo Mendez (chemist), Cayo Mendez, Chilo Mendez, Antonio Hernandez Lebron, Pablo Gerena & Polo el de Trevo. 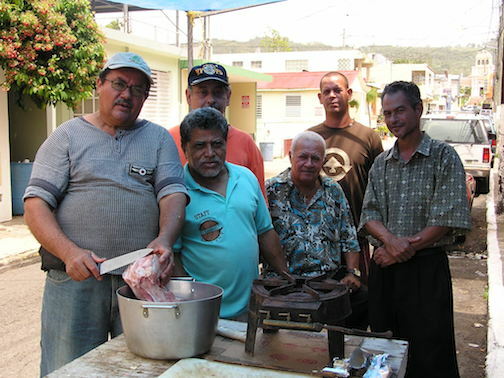 Their sodas were popular across the district of Aguadilla. I’m not sure if the Mendez mentioned were related to Don Pedro or not.